24.03.2015: COBALT (Contributing to building of awareness, learning and transfer of knowledge on sustainable use of raw materials) was a 2 year EU-funded project that brought together industry, civil society, research bodies, and public authorities to stimulate a joint debate on sustainable raw material. The project focused particularly on identifying the best ways to put sustainable raw materials management into practice, help inform future innovation activities, and support the European Innovation Partnership on Raw Materials. It also explored how the needs of EU industry and civil society could be simultaneously met through innovation along the value chain from extraction to final consumption. 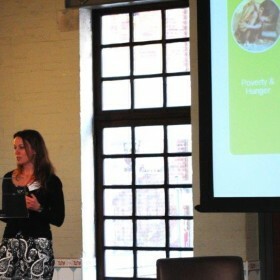 WorldLoop was approached as an expert in urban-mining, circular economy and partnerships fostering sustainable resource extraction and first gave a presentation at the 2nd EU Civil Society-Industry Dialogue on “Urban Mines, Consumer Behavior and Producer Responsibility in a Circular Economy” during EU’2014 Green Week in Brussels. The project is coming to an end this year and once again WorldLoop was asked to share it’s experiences connecting small entrepreneurs in developing countries with large recyclers in Europe and the unique challenges implementing the Best-of-2-Worlds can present.